NETWORK FINALS: SUNDAY NIGHT FOOTBALL adjusted to 6.1, down 0.1 from last week’s game. AMERICA’S FUNNIEST HOME VIDEOS gained 0.1 in final numbers, but 60 MINUTES and the reruns of NCIS: LA and MACGYVER lost the same. CABLE HIGHLIGHTS: After several weeks of steady drops, the 90-minute episode of AMC’s THE WALKING DEAD stabilized with a 0.05 rise to 4.95, as TALKING DEAD slipped 0.02 to 1.69 and COMIC BOOK MEN held at 0.29. The 90-minute season finale of HBO’s WESTWORLD was steady at 1.02, with DIVORCE down 0.04 to 0.21. Hallmark’s movie de jour LOOKS LIKE CHRISTMAS was at 0.64. 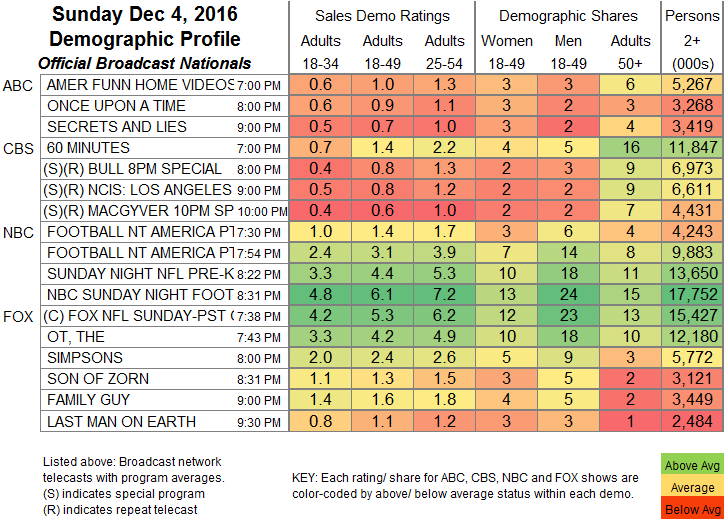 On Showtime, SHAMELESS gained 0.02 to 0.62, and THE AFFAIR was up 0.02 to 0.17. TNT’s THE LIBRARIANS slipped 0.03 to 0.49. Adult Swim featured a new trio of 15-minute shows: HOT STREETS at 0.43, APOLLO GAUNTLET at 0.35, and BAD GUYS at 0.30. 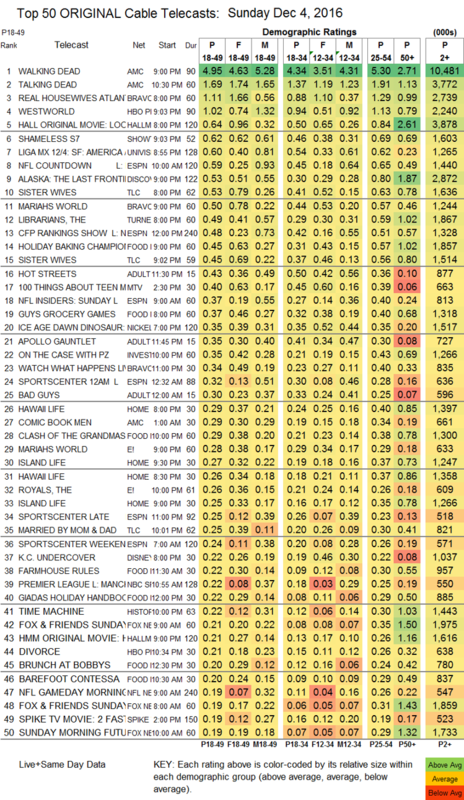 On E!, the 0.26 season premiere of THE ROYALS (down 0.15 from the 2015 premiere, although that was after a huge 1.27 KEEPING UP WITH THE KARDASHIANS lead-in) followed the 0.28 series premiere of the unscripted MARIAH’S WORLD, which rated much higher in a 0.50 Bravo simulcast. USA’s EYEWITNESS ticked up to 0.18. Nielsen lists Starz’s ASH VS. EVIL DEAD as a rerun, but it rated like an original, up 0.02 from 2 weeks ago to 0.14/266K; it’s harder to tell with the micro-rated BLUNT TALK, down 0.01 to 0.02/98K. Unscripted was led by Bravo’s REAL HOUSEWIVES OF ATLANTA, down 0.02 to 1.11, which as noted above was followed by a simulcast of E!’s MARIAH’S WORLD. Univision’s LIGA soccer match was at 0.60. Discovery’s ALASKA: THE LAST FRONTIER ticked up to 0.53. On TLC, SISTER WIVES rose 0.03 to 0.53, and MARRIED BY MOM & DAD ticked up to 0.24. ESPN’s noon CFP RANKINGS SHOW was at 0.48. On Food Network, HOLIDAY BAKING CHAMPIONSHIP grew by 0.07 to 0.45, GUY’S GROCERY GAMES was up 0.03 to 0.37, and CLASH OF THE GRANDMAS was steady at 0.29. A mid-afternoon MTV 100 THINGS ABOUT TEEN MOMS special was at 0.40.